The crayons are on strike! When Duncan opens his crayon box, all he finds is notes that say “We quit”. Orange and Yellow are bitter rivals. Blue is sick of water. Beige feels unloved. Will they ever draw pictures together again? 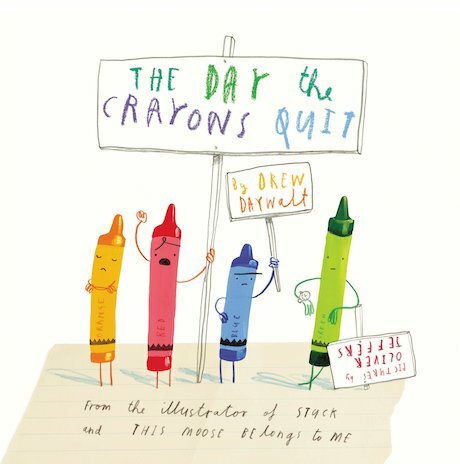 Star illustrator Oliver Jeffers teams up with hot new talent Drew Daywalt in a book full of quirky wit. An instant bestseller that will make you use your art kit in a whole new way. Thank goodness Oliver’s crayons didn’t quit until he finished it.